"I want to stress just how fast this all happened. By the time Serverus was crowned in 193 AD, the denarius was still the international currency, even though for the last few generations it had gradually been devalued. But a mere 22 years later, in 215 AD, India first rejected the denarius and then the devalued gold coins. And of course the world moved much slower in those days, with trade between Rome , India and China taking months. Seen in this light, 22 years was very fast indeed. After 215 AD and the final loss of Rome 's position as the owner of the world's currency, Rome 's trade, economy and living standards went into tailspins. The "silver" denarius lost so much more of its value that even Roman's [sic] wouldn't take it. Emperor Caracalla introduced a new silver coin, the antoninianus, but immediately started to remove silver from it. Within 45 years, by 268, this coin was nothing but base metal with a thin silver coating. As I will support in this essay, imbalances and systemic problems have become so severe that the economic downtrend in the United States will almost certainly accelerate dramatically at some point in the months and years ahead. The natural question is "When, exactly?" but exact timing and velocity of markets and other dynamic social phenomena are inherently unpredictable. Trends, historical examples, and current data are knowable, however, and they all tell us a storm is coming. The economy may drag on with the appearance of quasi-normality for a while longer yet – it has already done so for longer than many expected. "Markets can remain irrational longer than you can remain solvent," as Warren Buffett pointed out. But if economic timing and velocity are not predictable, the direction and amplitude of future economic events seem clear: data strongly suggest that we are moving towards a Greater Depression , or perhaps something even worse. This current and onrushing disaster is entirely the result of historically-typical and well-understood government dynamics and actions. Ordinary Americans have allowed, encouraged, and participated in these dynamics and actions because their understanding of government has been systematically and purposefully subverted, beginning with the adoption (via the Constitution) of a powerful central government and then especially with the push for Prussian-inspired government schooling  in the 1800s. The political and corporate power elite have encouraged these same dynamics and actions because they personally benefit from them, directly and indirectly. By now, the paradigm that Americans use to understand government has become so corrupted as to be massively out of sync with reality, to such an extent that Americans clamor for more of the same policies which caused the problems in the first place. If we are somehow able to avoid an epic melt-down of America’s economy (and perhaps the world’s), such a miracle would require a rapid and dramatic turnaround in the typical American’s understanding of the dynamics and effects of government action – it would require, in other words, the widespread adoption of a new paradigm. My scientific calculation on the odds of that happening in time: a billion to one against, with a margin for error of "not enough to matter." I will be surprised if more than a small minority understand the reason for the problem even after America ’s fall from economic grace. You may disagree with my conclusions – most do – but the facts themselves are widely known and not in serious dispute. Intelligent, well-connected and well-respected people have issued warnings in recent years on the problem; these warnings have been reported in the media and then, for the most part, forgotten. The situation continues to grow more precarious , which makes the "soft landing" many are hoping for less likely by the day. As for when the crash will become too obvious to ignore or deny: once again, many unknowns can trigger or affect the speed and nature of a great unwinding such as the one we now face. A few such possibilities: a U.S. attack on Iran; a nuclear U.S. attack on Iran ; a domino of bank failures triggered by overwhelming numbers of mortgage defaults and other credit defaults ; an acceleration of the world trend away from using the US dollar ; China and other mega-creditors dumping their massive dollar holdings and using the cash to buy commodities  and other real assets. The tipping point could happen before this column is published, or not for several more years. I lean towards "soon" however; I will be surprised if we get through the next year (or even this year) without our current Rube Goldberg  economy coming unraveled. I urge you to do your own research and analysis and come to your own conclusions, but please give this issue the time and consideration it clearly deserves. Stephen Roach, the chief economist at investment banking giant Morgan Stanley, has a public reputation for being bearish. But you should hear what he's saying in private. Roach met select groups of fund managers downtown last week, including a group at Fidelity. His prediction: America has no better than a 10 percent chance of avoiding economic "Armageddon." Press were not allowed into the meetings. But the Herald has obtained a copy of Roach's presentation. A stunned source who was at one meeting said, "it struck me how extreme he was - much more, it seemed to me, than in public." Yet, under the placid surface, there are disturbing trends: huge imbalances, disequilibria, risks -- call them what you will. Altogether the circumstances seem to me as dangerous and intractable as any I can remember, and I can remember quite a lot. What really concerns me is that there seems to be so little willingness or capacity to do much about it. The GAO found that the government’s true debt — on-the-books and off — more than doubled between 2000 and 2005, and now stands at a staggering $46.4 trillion. GAO, it seems, actually low-balled the true debt by using the entitlement obligations for only the next 75 years. To permanently fix these programs we’d have to put up enough money to cover all of their obligations forever. That’s where the Trustees Report comes in. Using the estimates from that report, the federal government’s true debt is shown to be a stunning $94.7 trillion. That’s more than $315,000 owed by every man, woman, and child in the United States . That’s $1.25 million in debt for every family of four. The Medicare “trust fund” is already badly in the red, and the only solution will be a dramatic increase in payroll taxes for younger workers. The National Taxpayers Union reports that Medicare will consume nearly 40% of the nation’s GDP after several decades because of the new drug benefit. That’s not 40% of federal revenues, or 40% of federal spending, but rather 40% of the nation’s entire private sector output! “It’s worth remembering that markets were very upbeat in the early summer of 1914,” said former U.S. Treasury Secretary Larry Summers. Summers was warning the attendees to this year’s upcoming World Economic Forum in Davos , Switzerland , that there are precedents for such bountiful seasons. The trouble is, history shows that such incredibly good times tend to be followed by incredibly bad ones. Concern for pricing oil only in dollars helps explain our willingness to drop everything and teach Saddam Hussein a lesson for his defiance in demanding Euros for oil. And once again there’s this urgent call for sanctions and threats of force against Iran at the precise time Iran is opening a new oil exchange with all transactions in Euros. Using force to compel people to accept money without real value can only work in the short run. It ultimately leads to economic dislocation, both domestic and international, and always ends with a price to be paid. “There are signs that dollar [sic] is at the start of a broad-based decline that reflects a downward re-assessment of the US economy,” said Paul Mackel, currency strategist at HSBC. Commodities investment guru Jim Rogers stepped into the U.S. subprime fray on Wednesday, predicting a real estate crash that would trigger defaults and spread contagion to emerging markets. "You can't believe how bad it's going to get before it gets any better," the prominent U.S. fund manager told Reuters by telephone from New York . "It's going to be a disaster for many people who don't have a clue about what happens when a real estate bubble pops. "It is going to be a huge mess," said Rogers, who has put his $15 million belle epoque mansion on Manhattan 's Upper West Side on the market and is planning to move to Asia . Last month we saw the first tell tale signs of things to come. The possibility of lower rates coupled with a declining dollar led to a fifty billion dollar shortfall in the flow of funds into the US . You see the United States needs almost three billion dollars a day of other people's money to survive and we didn't get it. So where did the difference come from? The printing press … . I've lived in Latin America for the better part of twenty-five years and for the first time, people don't want dollars. They actually prefer their own currency. … If a fellow with no education, a poor diet, and inadequate medical treatment living at 3,500 meters above sea level can figure out that the US dollar is undesirable as a store of wealth, how much longer do you think it can last as the world's reserve currency? The short answer is that the party is over and all things dollar related will go up the stack with it. What we saw last week is the equivalent of the first drops in a storm destined to last more than forty days and forty nights. You will surely have no trouble adding to these lists. Individually, such problems are serious enough. Add them together and we have a situation that not merely could, but will at some point spin rapidly out of control. The American dream, at least on the economic side, is fading. Most people see the United States as a special place where there is plenty of opportunity for someone to work hard, play by the rules, and get ahead - maybe even become wealthy. Today, though, nearly 1 in 5 American households has zero net worth or actually owes more than it owns. And the odds of a son or daughter rising above their parents in such a financial predicament have shrunk. "Income mobility has declined in the last 20 years," says Bhashkar Mazumder, an economist at the Federal Reserve Bank of Chicago . From 1950 to 1980, Americans were more and more likely to see their offspring move up - or down - the income ladder. For example: poor parents in the US had good odds of seeing children make great strides in overcoming their parental heritage. And if they lived long enough, they might well find that a grandchild had risen to a median income level. Today, it could take five or six generations to close the gap between poverty and middle-class status, calculates Mr. Mazumder. It's a Thursday today. 2007, by the way. But the news of the day comes to us from the waaaaay back machine: 1933. The personal savings rate the year Franklin Roosevelt moved into the White House was -1.5 percent of disposable income. Makes sense that people were dipping into their savings when you remember the Great Depression was in full swing. Seventy-three years, later [sic] the economy's a whole lot better. But we've gone back to our spending ways. The Commerce Department told us this morning that last year, the savings rate hit it's the lowest level since the early 1930s. In addition to spending their savings, going deeper into debt, and living in a more difficult economic environment, the average American family is, remember, saddled with over a million dollars in federal debt; living with decaying infrastructure (roads, bridges, sewers, etc.) caused mostly by government spending too many tax dollars on other things and not enough dollars on fundamentals; and supporting wars of foreign aggression (that is, against nations which have not attacked us and were realistically never a danger to us) with not only their tax dollars but with the lives and bodies of their sons, daughters, mothers, fathers, aunts, uncles, cousins, and friends. The negative savings rate in this supposedly wealthy nation is a warning flare, alright, but it is only one symptom in a very broad drama of destruction. Experience hath shewn, that even under the best forms (of government) those entrusted with power have, in time, and by slow operations, perverted it into tyranny. If Americans ever allow banks to control the issue of their currency, first by inflation and then by deflation, the banks will deprive the people of all property until their children will wake up homeless on the continent their fathers conquered. All I can do in this short column is present an overview and point you to further resources. I will include enough detail to, I hope, illuminate the path from relative freedom and sound economics to our current corrupt and massively imbalanced system, but I will of necessity leave much out. I encourage you to further educate yourself on the topic to the extent you are interested. * Members of the Continental Congress write the Articles of Confederation  in 1776, as the war for independence gets underway. The Articles are adopted by the Congress the following year and finally ratified by the states in 1781. The government created by the Articles is more a trade agreement and set of rules for loose alliance among thirteen sovereign nations than a blueprint for a central government as we know it today; this "government" does not even have the power to tax. There are ten* "Presidents of the United States under Congress assembled" (as they were called); Samuel Huntington  was the first. No State shall enter into any Treaty, Alliance, or Confederation; grant Letters of Marque and Reprisal; coin Money; emit Bills of Credit; make any Thing but gold and silver Coin a Tender in Payment of Debts; . . .
One might object that this is a restriction on the States, but of course the United States is just that: a collection of states. If it is unlawful to "make any Thing but gold and silver Coin a Tender in Payment of Debts" then – other than perhaps in the District of Columbia – gold and silver are the money, and anything else (such as paper) clearly would have to be convertible into gold or silver at a defined rate of exchange – as in fact was true for most of this nation's history. Why is that significant? Because gold and silver cannot be "printed up" like paper money, which puts a powerful restraint on government spending. Governments have historically stolen from the people by means of counterfeiting; that is, by printing more and more money, just as a counterfeiter prints $100 bills in his basement. Governments, being vastly larger than a single private counterfeiter, do vastly more harm in this fashion. The ocean of newly-created cash that can be generated by government erodes the value of every existing dollar (or yen or other unit of currency). This inflation of the money supply has historically financed wars and empires; it has been used to bribe populations with social programs (the modern version of "bread and circuses " in ancient Rome) – which also has the effect of making citizens more dependent upon politicians and government – and to fill the coffers of favored corporations, special interests, and those in power by funding mandates and programs (most often war ) that government would otherwise be unable to pay for. Such inflation of the money supply is what leads to price inflation: more dollars (or pesos or whatever) chasing the same amount of goods and services, resulting in higher prices generally and often creating investment bubbles, which inevitably crash, destroying the finances of those participants who did not sell near the top – and thus transferring massive wealth to those few participants who DID sell near the top. Examples of bubbles include the John Law  episode in France , the stock-market bubble of the Roaring Twenties in America , and of course the recent stock-market bubble of the late 1990s and our just-now-dying real estate bubble. Extreme cases of monetary and price inflation are called hyperinflation , and such episodes are far more common than most people realize. Could a hyperinflation happen in modern-day America ? Yes; print up enough money and hyperinflation becomes inevitable, more or less by definition. Many believe we are already on the road to such an episode. It is worth considering that a nation does not even need to run the physical printing presses overtime as in the past; the number of dollars can now be increased to infinity electronically, essentially by pressing a few buttons at the Federal Reserve. (The "few buttons" part is fanciful, perhaps, but the basic idea is not). For most of this nation's history, a dollar was defined as a specific weight of gold or silver. For example, a $20 gold piece, such as the $20 Liberty coin  (also called the Double Eagle) contained .9675 ounce of gold. The difference between that amount and an ounce was the seigniorage, the mint's cut for producing the coins. In most discussions – and for most of this one – the seigniorage amount is ignored and a $20 gold coin is thus said to contain an ounce of gold. The important thing is that the amount per coin was specific, legally-defined, and unchanging. Anyone could slap a $20 bill on the counter at a bank (or a hardware store, for that matter) and exchange it for a $20 gold coin. $66.89 in the year 1900 has the same "purchase power" as $100 in the year 1800. So a hundred years later (starting in 1800), the dollar had become worth significantly MORE than before. That's not because of bank interest or stock dividends or anything else: it is the return you (or your heirs) would get for just putting cash under the mattress and waiting a hundred years. Your wealth grew substantially in that period. $1656.53 in the year 2006 has the same "purchase power" as $100 in the year 1800. We will discuss how that disaster was arranged in a moment. For those interested, here is the government's own CPI calculator, at http://data.bls.gov/cgi-bin/cpicalc.pl . ** The "start" year begins at 1913, oddly enough . . . and this calculator shows $100 from 1913 having the same value as $2,036.36 in 2006 (or $2055.55 in 2007). So, if your grandfather had put $100 in U.S. gold coin under the mattress and you found it today, you'd have something worth a lot more than a modern $100 bill. And wait – the reality is that five $20 one-ounce gold coins are worth , as I write these words, $3261 at $652.20 each. That buys a fairly decent used car, or over 1185 gallons of gasoline at $2.75 per gallon (good for 23,700 miles of driving – about two year's worth for most people – at 20 mpg). Not bad for a hundred bucks. Had your grandfather put $100 in paper money under the mattress – assuming it didn't get eaten by moths or otherwise destroyed – it would now be worth (drum roll, please): $100. Somehow, your grandfather's $100 bill lost $3161 in purchasing power. How was it made to happen? Why was it made to happen? One final question before we continue: what IS the actual value of a modern dollar? What, other than "a unit of U.S. currency," is the definition of a dollar? What is the dollar's intrinsic worth? The answers are all, essentially, "nothing." Today's fiat dollar is a cipher, a unit without meaning, an illusion. Anything that can be produced in any amount for almost no cost or effort is worthless as a unit of exchange, for reasons that should be obvious. How much longer will the world use an inherently worthless, undefined cipher as reserve currency? How much longer will the world send us oil or anything else of real value in return for dollars that America creates from thin air? I suspect the answer to both questions is: "not very long." * Back to the timeline: 1913 is a pivotal year in our journey, because it sees creation of both the Federal Reserve  and the income tax. How did America go from a currency system that by law consisted of gold and silver, to one based on nothing whatsoever? Answer: the Federal Reserve. The Federal Reserve is not a federal agency, nor does it have any "reserves." It is a private bank chartered to issue money for the United States . It does this by creating money out of nothing and then loaning that money to the U.S. Treasury and to banks, at interest. The Fed is famously shrouded in mystery, and nearly everything one sees or hears about it seems designed to obfuscate rather than clarify the Fed's actions and effects. This alone should be a huge red flag, even were one not aware of the incredible loss of value the dollar has suffered under Fed management, or of the Constitutional prohibition against fiat currency, or of the vile history of central banking generally. A page at HowStuffWorks  says "In this article, we'll visit the mystical world of the Fed. . ." – and backs up that characterization with nineteen sections that go into excruciating detail without really getting to the heart of the matter. Their second section, "Why we need the Fed," makes it sound as if the pre-Fed monetary situation was disaster, and the well-run, scientific institution of the Federal Reserve was created simply to, as the article puts it, "organize, standardize and stabilize the monetary system in the United States ." I would argue that causing the dollar to lose 97% of its previous and highly stable purchasing power is a poor example of "stabilizing the monetary system." * Again, back to our timeline and the income tax: as mentioned, the income tax is created (via the 16th amendment) in the same cursed year as the Federal Reserve. An amendment is necessary because the Constitution, as written by the Founders, prohibits an income tax as we have today. Why, one might ask, was an amendment not deemed necessary to insert the Fed into our lives when the Constitution prohibits fiat money just as clearly as it does an income tax? The answer seems to be "because the Fed was a stealth attack." Until 1933 (the next point on our timeline), the dollar remained freely exchangeable for gold at the original rate. It was only in 1933 that the Fed's inflation of the money supply could no longer be sufficiently hidden. Foreigners were becoming reluctant to accept our money at face value; they wanted gold in trade, not depreciating greenbacks. Roosevelt called in all U.S. gold coins, made possessing more than a handful of gold coins a crime punishable by jail time and a large fine, and then massively devalued the dollar for U.S. transactions with foreign governments, from $20/oz to $35/oz. (and so much for the protection of rights via the Constitution). That took care of things for a few decades, but on August 15, 1971 (the arbitrarily final point on our timeline), Nixon "closed the gold window." That is, he declared national bankruptcy for the U.S. by completely ending any defined connection between the dollar and gold. U.S. citizens – who had continued to think they were "free" this whole time – were finally allowed to own gold again (starting in 1975). From 1971 on, the dollar has been a pure fiat currency; not money itself but rather the illusion of money. No government in history has ever resisted the chance to inflate a fiat currency into the ground, and the United States has proven itself no different in this regard. Back to the income tax: For the first 137 years of our history, the United States had no permanent income tax (although Lincoln established one illegally during the Civil War; it was overturned after the war ended). During those 137 years (with few and brief exceptions), our money was gold and silver, and price inflation (as opposed to up/down fluctuations for individual items and services) was zero. Actually, price inflation was less than zero for more than a century, as shown earlier. Once the Fed and the income tax came into being, things changed, at first slowly and then much faster. The dollar became ever-more-worthless and the percentage of a typical family's income taken by government at all levels has grown from one or two percent in the first half of the 1900s to over 55% today (this includes FICA, Medicare, and, in most states, a state income tax). Then there are sales taxes, property taxes, and many other taxes, in ADDITION to the 55%. Let me say that again: tax rates on a typical family have gone from almost nothing – in the range of 1% to 2% – to well over 50%, and they continue to grow. This incredible increase in the rate of income confiscation has largely been concealed by the increasing bounty that technology and a free market have created for us, but – as we have already seen – those factors are being overwhelmed by the crushing burden that government has imposed and which it continues to increase. Our markets are no longer so free, and neither they nor high technology can create enough wealth to counter today's massive cost of government, in part because high-tech and the markets have been increasingly hobbled by government regulation, interference, and funding (funding=control). For a good visual presentation of the data, here's a Federal Income Tax Inflation Chart  that shows how dramatic this crunch has really been, in terms of both dollar inflation and inflation of the tax rate. This tsunami of money – from taxing the wealth created by hard-working Americans and from the massive and illegal creation of fiat money (section 10 of the Constitution, again) – did more than impoverish American citizens; it did more than merely take money directly from them and erode the value of every dollar they earned. This largest inflow of wealth ever seen by any government in history was used in ways that most often harmed Americans instead of benefiting them. In the months and years ahead, that truth will become ever-more apparent. My title for this essay – "Destruction by Paradigm" – is meant to highlight that the overall mental framework most Americans now use to understand government (and society generally) has kept Americans from objecting to the destruction of their own liberties and prosperity. The faulty paradigm so widely used actually leads Americans to call for more of the same policies and programs that have brought this country to the brink of disaster. Paradigms are tools – frameworks – for understanding broad phenomena (e.g., the paradigm of science versus that of superstition) – and a paradigm can be more accurate or less so. A paradigm that excuses tyranny, that praises coercive centralized control and the people exercising that control, that makes the coercion of forcible government appear decent and normal and even positive, and which asserts that compassion can be expressed by coercively-funded government programs – such a paradigm is nothing less than a weapon against the great mass of people, wielded by the power elite. Such a paradigm blinds people to the evil of coercion and to the harm it inevitably causes; such a paradigm disconnects people from their own rights and responsibilities and strengths; such a paradigm ensures that – since "more government = more compassion" – people will clamor for ever-more government, until inefficient and corrupt government programs, regulations, and mandates crowd out honest and efficient non-government efforts. Eventually, such a paradigm, if severe enough and widely-enough held, must lead to a government so large and so controlled by corporate and other powerful interests, that the rights and welfare of the people themselves become crushed under the weight of so much tyranny, well-meant though much of it may be. Nearly every problem discussed in this essay is the end result of the slow corruption of a paradigm that held genuine freedom in highest regard, into a paradigm in which "patriotism" has morphed into "obedience to authority" and in which freedom itself has become increasingly suspect; a paradigm in which almost nothing is beyond the control of congress, and thus in which almost nothing is left to the people themselves; a paradigm in which even if government could grow to 500% of GDP it would not be enough to do all the things ordinary people are hoping and clamoring for government to do, not to mention all those things that defense contractors and other corporate interests are hoping and scheming for. The founders of this nation (in which I include the average person) held a paradigm in which "freedom" meant something more than doing what you were allowed to do, or forced to do, by your masters. They held a paradigm in which civil society was nearly everything in life, and coercive government was a very small "necessary evil" – a mistake, we now know, because as I have said before , coercive government is not a "necessary" evil but merely an ancient one. Nonetheless, freedom in early America was astonishing compared to most times and places. There were, for example, no passports or travel restrictions of any kind for most of our history – how many today can even imagine such a thing? For another example, your mind and body were your own – anyone could walk into a drug store and buy any drug whatsoever; it was not government's business what someone put into his or her own body. Mutual aid societies, churches, and charities provided help to those in need; using government for such things made no sense. Consumer and industry organizations provided consumer protection, as Underwriters Laboratories (founded in 1894) still does; you probably have a dozen or more items in your home that are "UL Listed." Other such groups exist as well today, as well. Government was so small during much of our history as to rarely encroach on one's life, and the specific and often lived up-to recognitions of human rights – in the body of the Constitution (habeas corpus, for one; our current President and his Attorney General may wish to read Section 9 to confirm that), in the Bill of Rights , and in the background understanding of life that defines a culture – were enough to make America a truly special place and in many ways a deserving beacon to the world. Why and how did that change in such dire fashion? In large part, because of flaws in the original paradigm, and in the too-low levels of both love and freedom within the United States at the time. Love and freedom literally require each other, and high levels of both are required for a health society. Love provides the anti-corrosive and lubricant for the market and for a free society generally; freedom protects human rights, emotional health, and life itself – a police state is never conducive to love and compassion, nor safe for the lives of its subjects. For more on the topic of love and freedom, see my archive (linked at the end of this column) or my website at http://www.paradise-paradigm.net . Early America was an amazing, unprecedented attempt at a free society – at a New World worthy of the name – but it nonetheless fell short. A nation which allows human slavery and which is slowly committing genocide against the original native inhabitants is neither free nor compassionate. The flaws and shortcomings of early American society and government (specifically, too much emotional damage and too much coercive power) have grown into the destructive Frankenstein we have today. That Frankenstein is about to fall. This will be a disaster, yet it is also a great opportunity. How are we to respond? There can be no quick fix; no magic cure for the political and economic dilemma Americans have gotten themselves into, but there IS a solution. It is imperative that more people hear and begin to understand that solution, else they will encourage the further destruction of their nation by the Two Great Evils  (as I have called them previously) of government coercion and widespread emotional damage. For an extreme and horrifying example, study the rise to power of the National Socialists in Germany  during the 1930s. The solution – the only real and permanent solution – is to widely spread the understanding that love and freedom are the two most important fundamentals in life; that these fundamentals are connected to and dependent upon each other; and that any system which denies either love or freedom is simply evil. Belief systems guide behavior, and only a paradigm that clearly and whole-heartedly embraces the duality of love and freedom will guide people to the healthier, saner, more free and compassionate world that every new human life is born expecting and needing. Such a world may also be the only world compatible with a human future. Twenty-first century technology is advancing at a dramatic, non-linear rate, and will hugely empower either health or sickness; either freedom or tyranny. This may be our last chance to get things right. The United States today denies love and freedom so deeply that its leaders justify torture and order its use. Our government violates the principles of love and freedom in nearly everything it does, from aggressive wars that have left hundreds of thousands dead, to a "war on poverty" that has caused millions of children to grow up without their fathers (else momma would lose benefits). The U.S. expresses its coercive, corrupt, and phony "compassion" by means of a "war on drugs" that has put millions in prison over the years (mostly for using a safe herb) and created vast and violent criminal empires; the reach of this particular policy has stretched across the globe, wreaking violence and corruption in Columbia, Afghanistan, and many other nations. America has overthrown  elected foreign governments (mostly for corporate gain), installed and supported vile dictators, and taught the secret police agencies  of those dictators how to torture dissidents and otherwise repress dissent. The list of such crimes by the United States against love and freedom are endless, as could only be the case for the largest, most expensive, and most powerful government the planet has ever known. "Power tends to corrupt, and absolute power corrupts absolutely," observed Lord Acton. Americans of his day understood that truth and took it seriously. It is time for Americans to relearn that lesson, and to apply it. It is time for us to learn also, and clearly, that coercive power is not the only enemy, because widespread emotional damage is the handmaiden of tyranny as well as a horror in its own right. As the coming storm gathers, and as it breaks upon us in the months and years ahead, remember that any approach which denies or subverts love and freedom can only lead us astray. 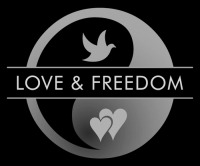 Love and freedom: we'll have both, or we'll have neither. Glen Allport  co-authored The User's Guide to OS/2 from Compute! Books and is the author of The Paradise Paradigm: On Creating a World of Compassion, Freedom, and Prosperity .